I was thrown into parenthood at a young age but now that my 6 boys are grown (ever heard of the Micro Dutch Army? Yep, those are my kiddos! Check out their photos:Alfred, Ansel, Arbus, Avedon, Frank, and Weston ), I have the rest of my long life to be the center of attention. I used to be a little scared when humans would pet me but I have learned that in the right lap, I love being spoiled with massages. 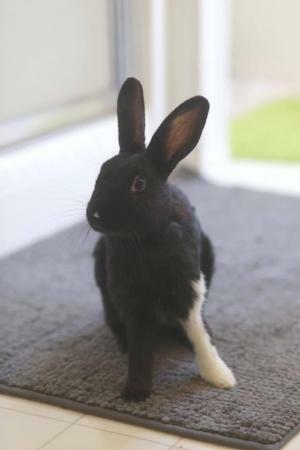 I am also a very adventurous young lady and love to explore so I’d love a house with lots of room to binky about and toys to chin. Here I am giving kisses to my foster mom. Annie kissed every trace of salt off my hands, arms and nose this evening. Thank you, sweetheart! Momma Annie munches on some parsley. She is such a sweetheart!